On Christmas Morning - the seed of a Merchant Navy. Story by Ross Hickey in Australia. On Christmas morning in 1954 I awoke to find a red, hard cover book, on various locomotives, placed on the seat of my, asked for, three wheeler bike. In this book was depicted Bullied's Battle of Britain class locomotive. It seemed to jump out at me. Later when my father purchased a set of encyclopaedia; there it was again ! Why this was happening to me ? I will never know — being in Australia. Although I am a certified mechanical engineer, I then moved into the building industry. However I missed the machine tools so I had to get some to play with, and that is how I got into model engineering and tool making. Moving on to 1978 I began taking 'Model Engineer' and in 1985, Keith Wilson began a construction series on the rebuilt Merchant Navy Class. I thought "it would be good to build that". Further on in the series, when the frame stretchers and motion brackets were detailed, I thought "forget it, too complicated". But a few years later I thought I should give it a go. First obstacle, 1/8" plate for the frames is not available here, although 3mm is — to surface grind 4mm to 1/8" is too expensive, so I used 3mm and increased the width of the stretchers to give 3 ¾" overall as per the drawing. 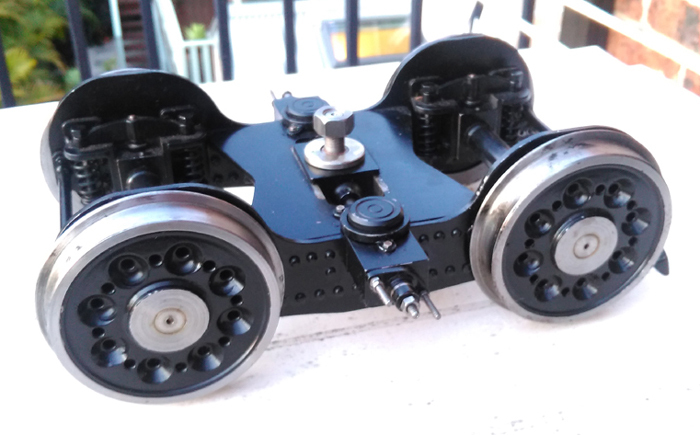 Next I made the front bogie using no castings, with the spring end covers on the "wonk", painted same and put it away. Then the frame stretchers and frames. Welding produced too much distortion so I resorted to Tig—Tak the parts together, then silver soldered which produced a much better result. As for the motion brackets, slide bar and reverse brackets I used mortise and tenon plus jigs, Tig—Tak and silver solder. The wheel castings were ordered and received, alas no balance weights --- funny that ! So I had to set about making and fixing them to the wheels. A loose piece on the pattern could have remedied this. Next came the cylinders, but due to casting problems none were available, and no delivery date could be given. One inside cylinder was in stock so I grabbed it. This was probably a reject as a piece of 10 swg wire core reinforcement was firmly trapped inside the piston valve bore, but it ended up ok.
As the outside cylinders were not available I decided to carve them out of 125mm dia spheroidal graphite cast iron, and so after much work I was pleased with the result. 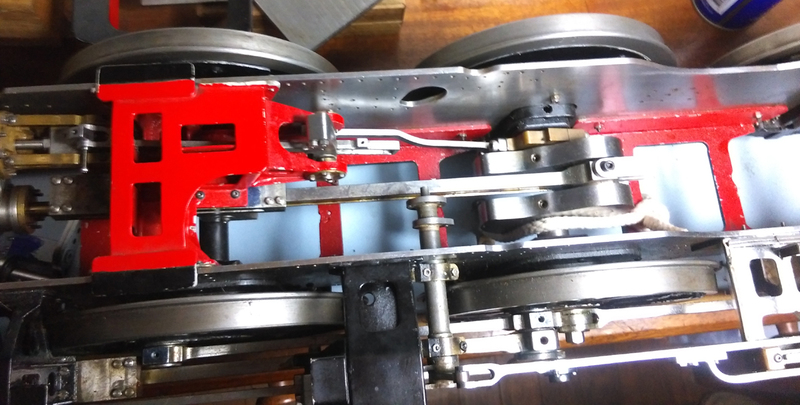 All the motion work was completed, connecting rods, coupling rods, expansion links etc, cylinders lined up with slide bars - all seemed to work smoothly, could be some issues with clearances ? There are still pins and split-pins to add, and someday I will muster the courage to try it on air. The wheels were turned from the solid, the pockets milled out on a rotary table; and at the same time those for the tender were also made. 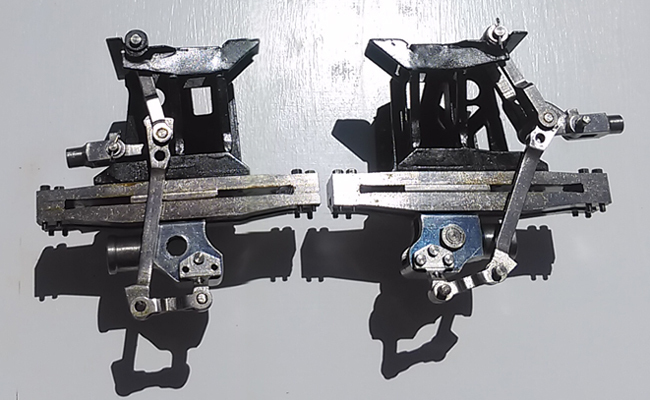 Then onto the brake gear, and I have now made all the brake parts with help from Ian Tiplady. 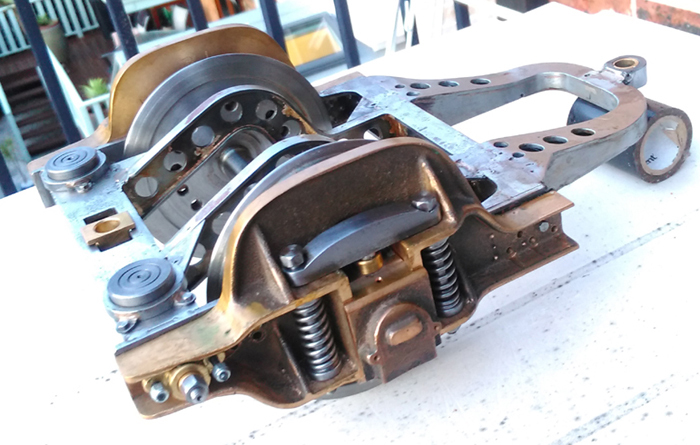 The reverse screw bracket, with its 8 TPI Acme thread and nut, together with the reverse gear box were the most time consuming to construct. My locomotive pretty much followed Keith's design, as I have not the luxury of crawling over an original example to get some finer detail. I have several books on Bulleid's locomotives, with many pictures, but as you may not be surprised, the particular part you are looking for some detail on, is just out of frame ! Such is life. 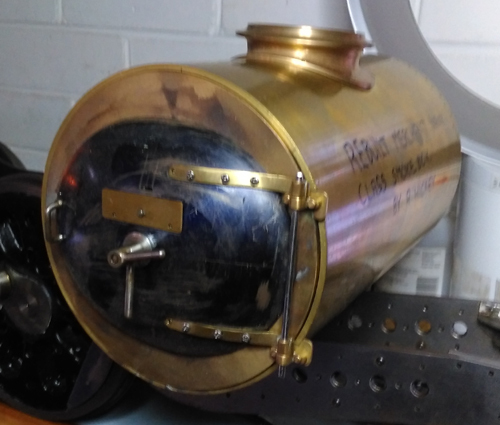 However I have now been diverted onto the boiler, which has been changed from the Ariel design to meet the Boiler inspector's requirements, and comply with the the Australian boiler code. 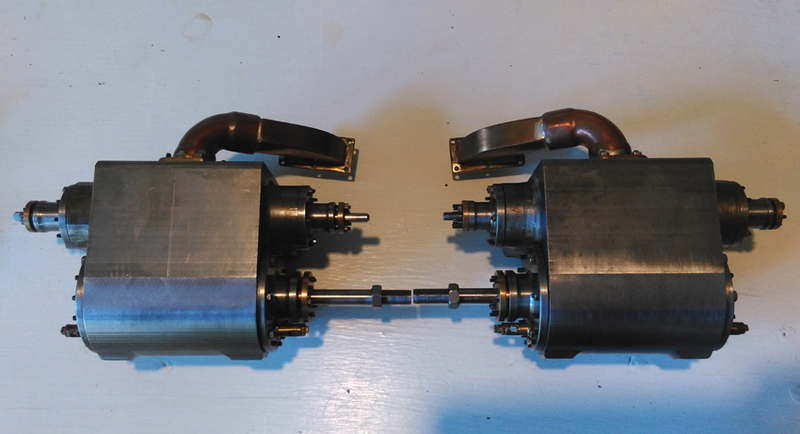 The front tube plate and backhead has been made of 4mm sheet and reinforced - no longitudinal stays; it will be similar to the design by Roger Lainson. 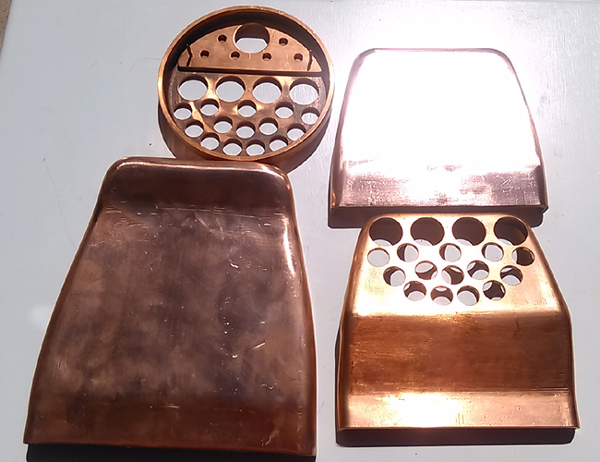 I rolled the barrel, and made the fire box plates out of 3 and 4mm copper. The boiler plates gave no trouble, just anneal and bash; once set up on the jig, alignment was easy. And in this photo the boiler had progressed, having been dry assembled to check how it went together for line-up and fit. Regarding silver soldering and heating the boiler, this was somewhat laborious. As for testing at mains pressure 110 PSI - the thing looked like a fountain ! Cracks around the firebox, tubes and various stays. Thus began a process of re-heat and test over many times. One step forward and two steps back ! Until - I was given some good advice by a fellow enthusiast - "Plug the tubes with Isowool Blanket to stop differential expansion and thus cracking." This procedure has also been explained by Mike Casey in his article on building 'Ariel' on this website. I further wrapped the boiler barrel in this blanket surrounded by 22 gauge Aluminium sheet, fixed in place by large Utilux clips. This helped with the expansion problem and greatly reduced the heating time. The boiler has now been passed by the inspector - a load off my mind. . In line with Bulleid's idea of commemorating those who served in the Second World War by naming his 'Battle of Britain' Class and 'Merchant Navy' Class; I have decided to call my Merchant Navy Class loco '460 Squadron'. Ach ! - I hear you say. However, this Bomber Squadron was predominantly populated by Australian personnel, and it is to their memory that I dedicate this locomotive. Its number will be 35031.